Heather Wardell, Women's Fiction: A finished crochet project! 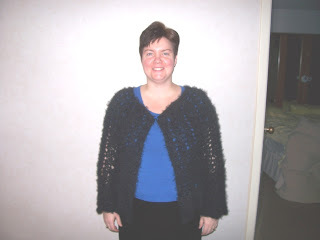 I have been testing a crochet cardigan pattern by the very talented milobo. Hers is done in a smooth sleek yarn and looks very classy. Mine's in Moda Dea Dream, a furry yarn, and has yeti-like qualities. But I love it! November 18, 2008 at 6:42 p.m. Awesome! I love finishing projects. Get them Done, Done, Done!! November 18, 2008 at 6:55 p.m.